Tilney All Saints post windmill was a small mill that stood in Podds Lane. The mill used a single set of French burr stones. 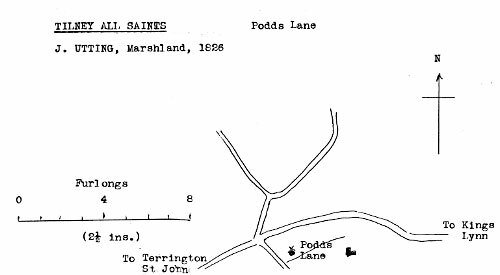 A MESSUAGE with a WIND CORN MILL and Appurtenances in good Repair and Two Acres of Land adjoining in Tilney All Saints in the said County, now in the occupation of Money Fisher. This Estate is Freehold and hath a Right of Common on Marshland Smeath. Enquire of Mr. Thomas Case at Lynn or Mr. Richard Camps at Setch Bridge. A MESSUAGE with a good Baking Office and a Wind Corn Mill in full Employ, with a Pair of New French Stones and other Materials therein and about 2 Acres of Land adjoining, in Tilney All Saints, near Lynn, now in the occupation of Mrs. Jane Fisher and Mr. Money Fisher. The above Estate is all Freehold, hath a Right of Common in Marshland Smeath and the Messuage, Mill and Materials are in good Repair, upward of £200 having lately been laid out thereon. For further Particulars and Conditions of Sale enquire of Mr. Richard Camps at Setch Bridge near Lynn or Mr. William Case, Attorney in Lynn. A Good Corn Post MILL with a Messuage and 2 Acres of Pasture Land, situated in Tilney All Saints near Lynn in the county of Norfolk, has a Right on a large Common on the Smeath and is in a good Wheat Country. Enquire of Mr. John Edwards at Lynn or of Thomas Norman on the premises. August 1784. Enquire of Mr. John Edwards at Lynn. A FREEHOLD ESTATE consisting of a capital Corn Post Windmill, a Messuage in substantial repair, new erected Barn and Stable and nine acres (more or less) of arable and pasture Land situate in the parishes of Tilney All Saints and Tilney St. Lawrence, occupied by Mr. Joseph Cartwright, under an agreement for a term of years of which two and a half will be unexpired on Michaelmas day next, together with the allowed right on Marshland Smeeth and Fen appertinent to the said premises. The above premises are exonerated from the Land Tax. Enquire of Mr. Hemington, Attorney, Lynn, Norfolk. William Edmund Overton, late of Tilney All Saints in the county of Norfolk, Miller, Shopkeeper and Baker. A Single man a Journeyman Miller & Baker, one who has served part of his time would be preferred. Apply to Mr. Jno. Cooke, Tilney All Saints, near Lynn.